Cincinnati, OH, USA; Minnesota Vikings wide receiver Cordarrelle Patterson (84) catches the ball and is tackled by Cincinnati Bengals outside linebacker Vontaze Burfict (55) in the third quarter of the game at Paul Brown Stadium. Cincinnati Bengals beat the Minnesota Vikings by the score of 42-14. Although the Bengals have wrapped up a spot in the playoffs and the AFC North championship, they still have plenty to play for this weekend against the visiting Ravens. Depending on what happens elsewhere on the last day of the NFL regular season, Cincinnati could still end up as the No. 2 seed in the AFC with a win, but will the Bengals have to go into action without one of their best players? 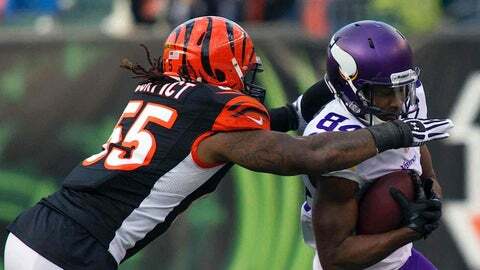 That seems possible as leading tackler Vontaze Burfict was unable to practice Thursday while he continues to recover from a concussion suffered in the team’s win over the Vikings last Sunday. Geoff Hobson of Bengals.com reported Burfict worked on the side without a helmet. Cornerback Terence Newman (knee), defensive tackle Devon Still (knee) and tight ends Tyler Eifert (neck) and Jermaine Gresham (hamstring) also missed practice for Cincinnati while cornerback Dre Kirkpatrick (ankle), linebacker Vinny Rey (ankle), offensive lineman Andre Smith (ankle) and tight end Alex Smith (concussion) practiced but were limited. Newman, a key veteran contributor since Leon Hall was lost for the season to a torn Achilles, has missed the past two games, but Hobson reports he "continues to rehab with an eye to the first playoff game." Arthur Jones and Asa Jackson missed practice Thursday for the Ravens while Elvis Dumervil, Gino Gradkowski, Ray Rice and Torrey Smith were limited. Rice and Smith both have thigh injuries.